University of Montana students rallied Thursday to support renewal of a 70-year-old legislative referendum that helps fund public colleges and universities statewide. As part of a statewide day of action, Montana University System campuses are raising awareness about the 6-mill levy on November’s ballot. 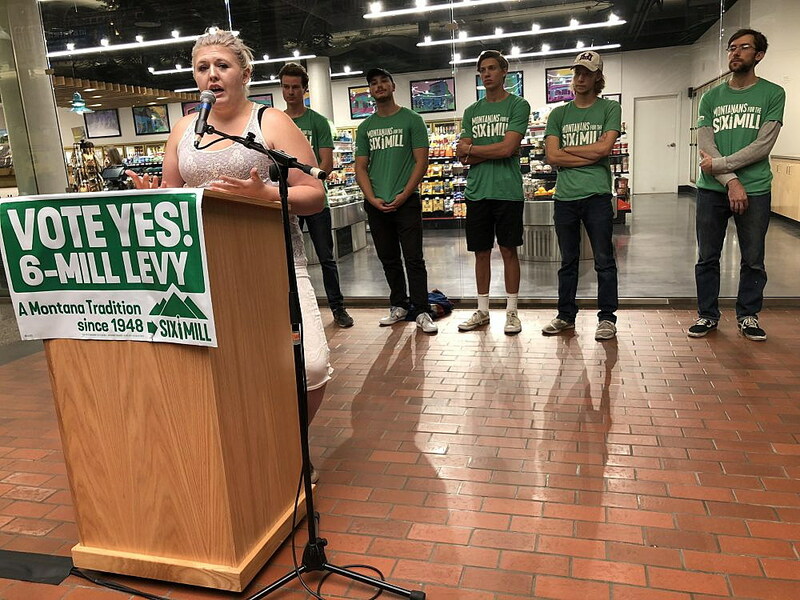 “We have a great opportunity in Montana today, where all college campuses in the Montana University System are working to pass the 6-mill levy,” Associated Students of the University of Montana vice president Mariah Welch said at a rally in the University Center. After the rally, volunteers began knocking on doors around the university neighborhood, Welch said. The mill levy will help fund academic programs and hire instructors, supporters say. It is not a new tax or a tax increase. It provides about $20 million in educational support for the 40,000 students in the university system, or 10 percent of the total state appropriated funding. Without the mill levy, MontPIRG field director Hunter Losing said programs could be cut or reduced on college campuses or tuition could increase by up to 18 percent, according to a report by the Montana Board of Regents. Sylvia Borstad, a student at UM, talked about her experience as a single mom and her plans for law school – if the mill levy passes. If not, paying for tuition could be more difficult. Tuition at UM’s law school already is about $13,000 per year for residents. The 6-mill levy is a legislative referendum that is voted on once every decade. It dates to 1948. Out of the $500 million budgeted for education through the Montana University System, $300 million is raised through tuition and fees, while $200 million is raised through state appropriations. Ten percent of that amount comes from the mill levy, regent and Kalispell banker Bob Nysteun said in an interview. Losing said the levy is a Montana tradition, and has passed every decade – although by a smaller margin in more recent decades. “It has never failed in its history, every 10 years it has passed. But it’s been passing at a lower and lower margin each year, so we’re trying to reverse that trend and pass it at a higher margin,” Losing said. Nysteun said that part of the problem is the time between reauthorization votes. More people enter the voting population in a decade’s time. While supporters fight for the funding, Montanans Against Higher Taxes states that less than half of every dollar contributed by state taxpayers actually goes toward higher education. However, Nysteun said the Montana Board of Regents and the Montana University System are transparent when it comes to where budget monies go, with accessible reports found on the website. Borstad said that after graduating law school, she plans to go back home to Kalispell and work on Child Protective Services cases and push for mental health services and drug rehab treatment. “I want to better the community where I came from so everything that is coming from these people, the property taxes from the 6-mill levy, I’m going to be using that and reinvesting that in the state of Montana to benefit Montana. And I’m just one of many,” Borstad said.